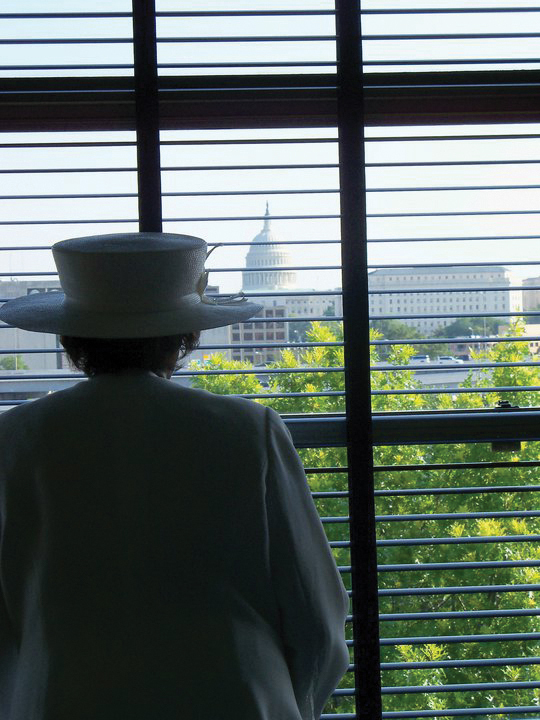 Washington, Gray-Haired Witnesses for Justice News – Gray-Haired Witnesses Fast for Justice on June 21 called attention to the growing numbers of incarcerated Black women and the gross over-sentencing in cases such as the Mississippi Scott Sisters, Jamie and Gladys. The Scott Sisters received double life sentences each in an alleged armed robbery of $11 in which no one was harmed or injured, and for which they have steadfastly maintained their innocence. This outrageous case became all the more urgent when Jamie Scott, now in the 16th year of this draconian sentence, suffered kidney failure in January and has had several close calls with death as a result of poor medical treatment in the prison. 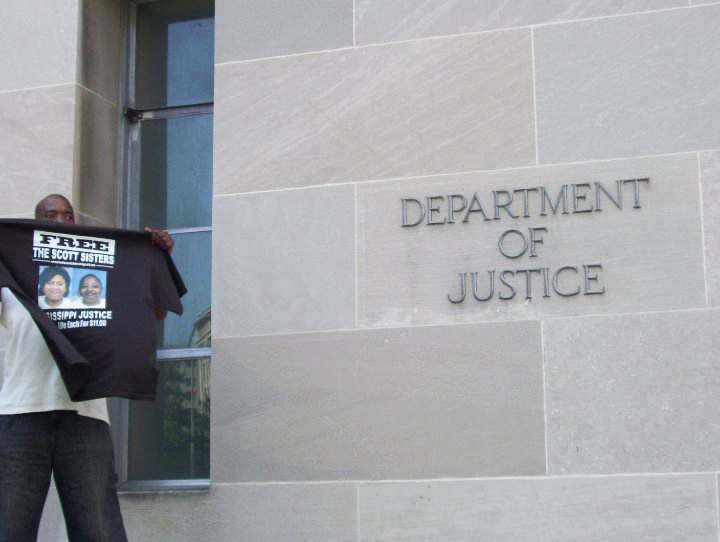 The rally began at the Department of Justice with a small but spirited protest and speak-out against the prison industrial complex and the disparity in arrests, sentencing and treatment during and after incarceration, particularly of Black people. Supporters came from as far as Boston and Mississippi to proclaim that the Scott Sisters must be released from prison and to support all those suffering under the Mississippi prison system, one of the worst for medical care in the country. “We are here to represent those who came before us,” stated Gray-Haired Witness B.J. Peak-Graham. “Our Ancestors cry through us demanding all justices denied.” Attorney Sam Jordan was very thorough and spoke with great conviction, as did Gloria and Clarence Bolls, Donnie Finley, Chioma Oruh and more. They were each eloquent and adamant that an investigation into the case of the Scott Sisters needed to be a top item on the Washington agenda and that enough is truly enough for this devastating case! Later that afternoon at Lafayette Park, the energy was still very high and a lot of information was shared with attendees and passersby. Brenda Branson, Spoken Word and Slangston Hughes were among those who brought the power to bear on this system during their hard-hitting and impassioned spoken word presentations, and the crowd was visibly moved by a beautiful musical performance by Khadijah “Moon” Ali-Coleman. The many speakers who brought dynamic information to the rally included Returning Citizens United, UNIA President General Senghor Jawara Baye, Clinton Alexander, Attorney Nkechi Taifa, Mike Johnson, revered community mother and esteemed elder Mama Nia and more, making for a very meaningful day of education and information that lit up the entire square and reached everyone within earshot. Attorney Ann Wilcox also took the stage and spoke in solidarity on behalf of the local Green Party and the Gray Panthers. The organizers were uplifted by those in attendance as well as all of those who supported but were unable to attend, and all expressed their love and admiration for the awe-inspiring courage and fortitude of Mrs. Evelyn Rasco, the true engine behind all of the organizing that goes on with respect to her beloved and suffering daughters. The movement is growing and all of the people who are organizing on behalf of the Scott Sisters around the country and world will be heard! “We come from a history of struggle. We must relearn that we don’t just lay down and accept injustice!” said Gray-Haired Witness Marpessa Kupendua. The women vowed to remain consistent and continue to move forward in the spirit of Ida B. Wells on this case and in other efforts to demand an end to the demonization and dehumanization of the Black community in general and Black women in particular in the future. To learn more and get involved, contact B.J. Janice Peak-Graham or Marpessa Kupendua at 1 (866) 968-1188, ext. 2, or ghwitnesses@gmail.com and visit http://www.grayhairedwitnesses.blogspot.com/.